In 1976, the United States sent a pair of space probes, known as Viking 1 and Viking 2, to Mars. Viking 1 was launched on August 20th, 1975, and Viking 2 was launched in September of the same year. Both probes photographed the surface of Mars from orbit, and one studied the planet from the surface. The first one touched down on the surface of Mars on July 20th, 1976 and the second a couple of months later. The main objectives of the mission were to obtain high-resolution images of Mars, to look for any evidence of life, and to learn more about the structure and composition of the atmosphere. As Viking 1 spacecraft was circling the planet, it spotted the shadowy likeness of a human face. An enormous head nearly two miles from end to end seemed to be staring back at the cameras from a region of the Red Planet called Cydonia. A pyramid structure was also seen. This will be the main topic of this article. As a quick side note here, for years we’ve been made to believe that Mars is a dry and arid planet, completely devoid of life, but that’s just not the case. Mars actually used to be an Earth-like planet, with giant oceans and extensive greenery. The soil is moist and wet, and there is a very high likelihood that some type of life exists within the interior of Mars today. You can watch that full press conference HERE. You can watch the full lecture HERE. He is one of multiple people accusing NASA of doing this. The Russian government did the same last year. You can read more about that here. Well, according to multiple insiders with extensive backgrounds, this is not the case, and NASA lied about the images and data they collected, as well as fudged data and images. Based on these testimonies, among others, the photos released in 1998 and 2001 were meant to debunk rumours and put the issue to rest. The picture above, which includes the pyramid, was taken from a lecture given by Dr. John Brandenburg (at the 26:46 mark). Any scientist who publicly shares information that challenges commonly held belief systems, as well as what’s been put out by mainstream media, will always come under public scrutiny and ridicule. But when you have worked on space plasma technologies, nuclear fusion, and advanced space propulsion, and invented the Microwave Electro-Thermal plasma thruster using water propellant for space propulsion, you deserve to be taken seriously. This is the case with Dr. John Brandenburg. He has also worked for the government with top-secret security clearances on various projects. He worked on the Rocket Plume Regolith Interactions on the Moon and Mars, Vortex theory of Rocket engine design, and the combined Sakharov-Kaluza-Klein theory of Field Unification for purposes of space propulsion and Mars science. He currently works as a consultant to Morningstar Applied Physics. Here is one of his latest research endeavours. Brandenburg also works as a part time instructor of astronomy, physics, and mathematics at Madison College, and other learning institutions in Madison, Wisconsin. “Someone complained to me, John, why do you have to bring Cydonia into this? And I said, because I can read a map. . . . Here’s what’s at Cydonia Mensa. There’s the face on Mars, there’s the D & M pyramid. . . . Here it is in a second shot, this was taken July 25th, this was taken 30 days later, the government was apparently doing a follow-up investigation. These two pictures (pictures above to your left) tell you everything you need to know about what’s at Cydonia Mensa (region of Mars). If you see on a planet that used to be Earth-like, a carved human face and a pyramid within 5 km of each other . . . it doesn’t take a rocket scientist to figure out what this all means, you can connect the dots. . . . I mean sometimes, and I can tell you as a scientist and I’ve seen other scientists do this, if you’re cornered, you’re just brazing it out, you hold up a picture of a buffalo and insist that it’s a dog. You can watch his entire lecture, or read THIS article we recently published on it to get his main points. Dr. Brian O’Leary was a NASA astronaut, and a member of the sixth group of astronauts selected by NASA in 1967. After this, he was recruited by Carl Sagan to teach at Cornell University in the late 1960s, where he researched and lectured in the Department of Astronomy and Physics. After Cornell, he taught physics, astronomy, and science policy assessment at various academic institutions, including the University of California Berkeley, Hampshire College, and finishing off at Princeton University from 1976 to 1981. After that, he went on to Washington, where he would become an advisor to various political leaders, presidential candidates, and the United States Congress. O’Leary was also a member of the American Association for the Advancement of Science, as well as secretary of the American Geophysical Union’s Planetology Section. Furthermore, he was the team leader of the Asteroidal Resources Group for NASA’s Ames Summer Study on Space Settlements. He was a founding board member of the International Association for New Science as well as founding president of the New Energy Movement. O’Leary was always skeptical about Mars, and there are several others within these circles who were as well. I will be focusing on three. He had some interesting things to say during a live interview with Kerry Cassidy of Project Camelot (view full live interview here, read transcript of video here). O’Leary and Carl Sagan were close for a number of years, but had a falling out when O’Leary decided to leave Cornell. At this time, Sagan and O’Leary were arguably the world’s two leading experts on Mars, and they entered into many disagreements over that face. This rift was made clear in O’Leary’s publication in 1998, “Carl Sagan & I: On Opposite Sides of Mars.” It can be found in The Case for the Face: Scientists Examine the Evidence for Alien Artifacts on Mars, eds. Stanley V. McDaniel and Monica Rix Paxson. Kempton, IL: Adventures Unlimited Press. In May of 1990, O’Leary released a paper titled “Analysis of Images of the Face on Mars and Possible Intelligent Origin” which only further demonstrated his skepticism. It was published in the Journal of the British Interplanetary Society, Vol.43 No.5. I began to realize, just directly from the scientific point of view, not only hearsay, that this man was colluding with NASA, that there might be more to this than before. . . . Carl was on a committee with a number of notable people. There was a report issued by the Brookings Institution in 1961 — and that’s about when I knew Carl, during those years; the ’60s mostly was when I worked closely with him — that he and this other group said: Well, if any ETs ever showed up on the Earth, it has to be covered up. That’s the only way we’re going to be able to manage this, because if we can’t, then it would be too much of a culture shock. Quite a shocking statement from someone of Brian’s stature, isn’t it? In the interview, he goes on to say that Carl and his colleagues recommended that the governments cover up the UFO phenomenon, and that he believes this provided justification for the ongoing coverup. When it comes to Mars, as mentioned earlier in the article, Sagan was a big debunker of the face, publishing multiple works stating that it was not a face, there were no pyramids, and that these are all the stuff of conspiracy theories. A mechanical engineer, Dr. Bergrun has worked for Ames Research Laboratory, NACA (National Advisory Committee for Aeronautics), and Lockheed Missiles and Space Company, now known as Lockheed Martin. He then went on to found Bergrun Engineering and Research. Obviously, he is another qualified individual with an impressive background. You can view some of his publications for NASA, where he worked for more than a decade, here. 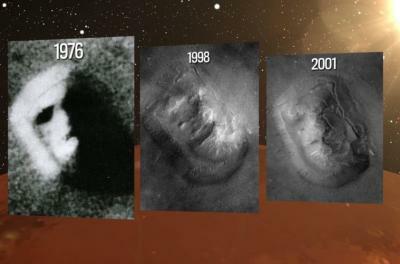 In THIS interview, Bergrun accuses that agency of “garbling” photos and fudging data, as well as the face that was found in Mars in 1976. What Does This Tell Us and Why Is It Important? We live in an age where more and more people are waking up to the secrecy that plagues our planet. Ten years ago, if you were to mention that we are being ‘watched’ through various high tech means, it would have been unbelievable, but thanks to people like Edward Snowden, we know this to be true. It’s unfortunate to realize that so many facts about our world are kept hidden from us, supposedly for the sake of ‘national security,’ but it’s quite evident that there are also special interests at stake, and secrecy is used to preserve and uphold these interests, whatever they may be. Today we have many whistleblowers with verified credentials from various agencies and branches of government who are spilling the beans on several different topics, as well as other evidence to corroborate and back up what the say. Our website is full of examples; the ones presented in this article represent just a select few. While witness testimony is not always deemed credible, when you have up to, arguably, more than one thousand qualified people coming forward, it becomes difficult to ignore. Today, in 2016, it’s important to keep an open mind, because information will keep emerging that threatens the belief systems of many. Too often we completely shut down any chance of even entertaining this type of information, and that’s done out of fear. When we’ve been shielded from the truth for so long it can indeed be scary, and sometimes downright unbelievable, to wake up to the truth. Secrecy is a great way for the establishment to keep us in line and prevent the human race from growing, expanding, and exploring, but our consciousness is shifting. We are becoming more aware, more curious, and more passionate about creating a better human experience for the entire race. We are constantly distracted with our own lives, trying to put food on the table and make it through another work week, having our minds, thoughts, and wants programmed into our brains through mass marketing, but many people are no longer resonating with this type of human experience. It’s time to start asking the bigger questions. It’s time for the human race to leave its infancy and grow into adulthood, and transparency is the first step. Proper progress cannot be made if a civilization tries to move forward blindly, unconscious of the true nature of reality.